Conference proceedings. Technical papers. Software user manuals. Trade magazines. (Anyone interested in back issues of SGI’s Iris Universe?) Old versions of our own training notes and documentation. I was cleaning off a bookshelf to make room for even more documents when I found a bit of history. (OK, using the word “history” might sound a bit overblown. Instead let’s call it ephemera.) 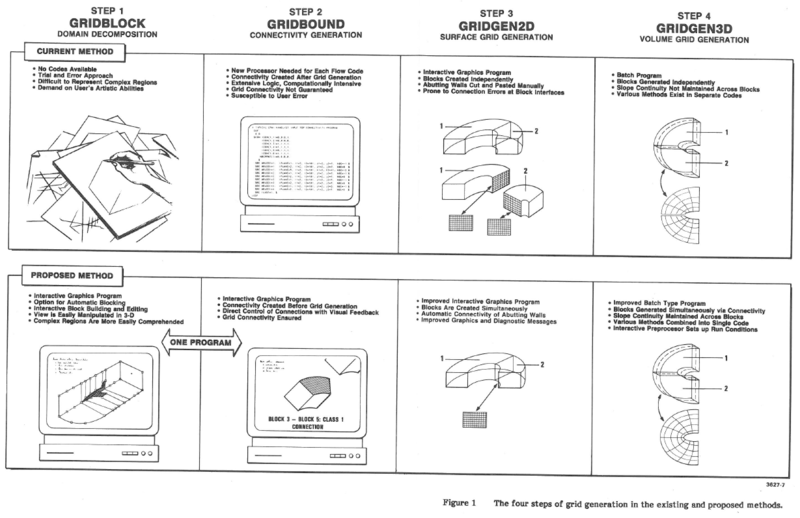 Technical Proposal for Viscid/Inviscid Flow Zonal Methods, dated 21 April 1987, was the proposal we submitted in response to an Air Force solicitation for a multi-block, structured grid generator. As luck would have it, the proposal was selected for funding and we began 3 years of work that eventually produced GRIDGEN Version 6. By “we” I mean myself, John Steinbrenner, and Chris Fouts with liberal assistance and editing by George Howell. 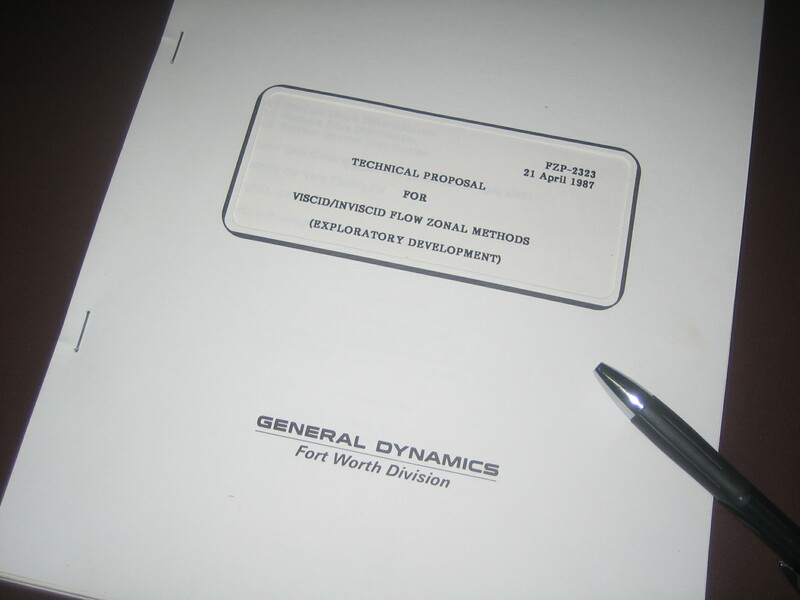 At the time we all worked together at General Dynamics, now Lockheed Martin Aeronautics in Fort Worth. John Steinbrenner led this effort, having completed his M.S. three years earlier with a thesis on adaptive grids. John had also spent the previous three years in the nascent CFD group developing gridding capability from scratch (i.e. GRIDGEN versions 1-5). As you know, John is a co-founder of Pointwise and the man behind most of its “science,” including T-Rex. Back in 1987 I had only recently transferred to the CFD group having started my professional career in Propulsion Analysis. But while working on my M.S. I had the good fortune to take a grid generation course from Rich Hindman. He gave grid generation such a positive appeal that I knew that’s what I wanted to work on. (I know, the appeal of grid generation should be obvious to everyone.) When it became clear that we were writing the proposal I ingratiated myself onto the team. What you all know as Pointwise (or Gridgen) originally consisted of three separate programs: GRIDBLOCK for creating topology, GRIDGEN2D for surface gridding, and GRIDGEN3D for volume gridding. The proposal is chock full of vintage factoids and here are a few that I found notable. The first code developed was the surface gridder, GRIDGEN2D. The early production versions of GRIDGEN2D ran on a VAX and displayed on a VT-240. However, GRIDGEN2D was the first program ported to the first Silicon Graphics workstation acquired by General Dynamics (a Model 2400 if memory serves me correctly). The SGI gave us a huge productivity boost because of its interactivity and from then on GRIDGEN was available exclusively on SGIs. One of the best aspects of the proposal was combining two “pre-preprocessing” codes into one. GRIDBLOCK was a sketchpad for creating block topology in 3D and GRIDBOUND was a unique interactive program for looking at the blocks in computational space (i.e. parallelepipeds) and defining how they all connect. GRIDBOUND was absorbed into GRIDBLOCK much to everyone’s benefit. There was a fifth tool in the GRIDGEN system that was, for better or worse, given secondary status – GRIDVUE for examining the volume grids generated by GRIDGEN3D. If you are keeping score, Steinbrenner worked primarily on GRIDGEN2D, Fouts on GRIDBLOCK, and I did GRIDGEN3D. Those are a few of the highlights of how GRIDGEN Version 6 came into being. We were fortunate to be able to extend that into the (mysteriously unreleased) GRIDGEN Version 7, Version 8, and Version 9 followed by the founding of Pointwise and 17+ years later we have Pointwise (the software) Version 17. If you want to learn more about how far we’ve come since GRIDGEN V6, click the link below to see what Pointwise V17 is all about. This entry was posted in People & Places, Software and tagged Gridgen, Pointwise. Bookmark the permalink.